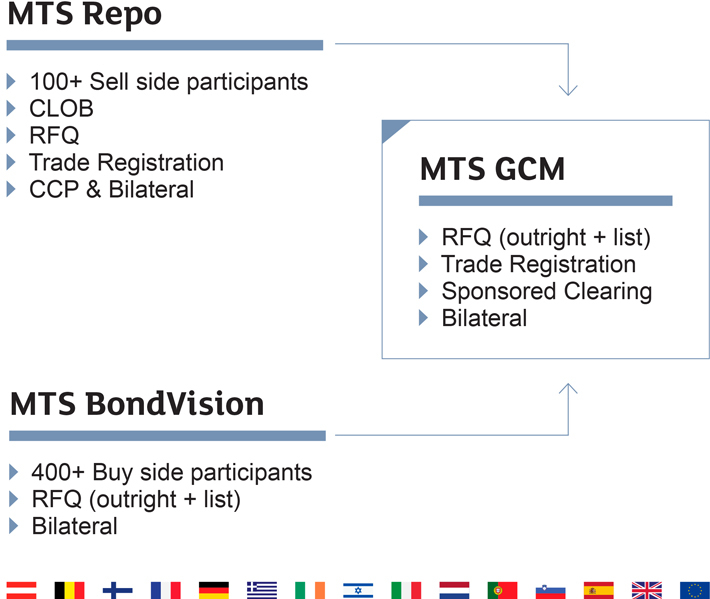 MTS’s Global Collateral Management (GCM) service combines the functionality and technology of its established D2D Repo and D2C Cash platforms to create a dedicated new section on MTS BondVision, enabling direct electronic D2C trading in repo contracts. By adding RFQ trading functionality to its existing Repo technology, MTS enables sell-side dealers to trade with buy-side clients using familiar protocols, existing connectivity and automated straight through processing (STP), requiring limited, or no development work on both sides. With a desktop presence at over 100 sell-side institutions via its MTS Repo platform, and over 400 buy-side institutions via its MTS BondVision platform for cash bonds, MTS is ideally placed to help buy-side clients seeking access to balance sheet in an environment of reduced collateral availability and increased regulatory burden. The unique dealer axe pages help highlight dealer inventory, linking to interdealer quotes to ensure axe integrity. Automated connectivity to LCH’s recently launched Sponsored Clearing gives buy-side clients using this service, and the banks with whom they trade, the opportunity to offset and net balance sheet exposure improving access to liquidity whilst providing the added security inherent to CCP trading. As part of London Stock Exchange Group (LSEG), and in anticipation of the Securities Financing Transactions Regulation (SFTR) expected in 2018, MTS is working with UnaVista, LSEG’s award-winning European Trade Repository, to further enhance the platform by providing a seamless solution enabling participants to meet their reporting requirements, if needed.